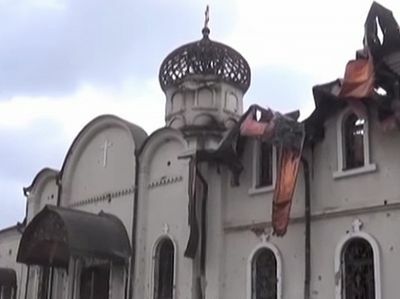 Despite the fact that many churches of the war-torn districts of Donbass are destroyed, the faithful keep praying and are continuing the liturgical life on ruins of their shrines. 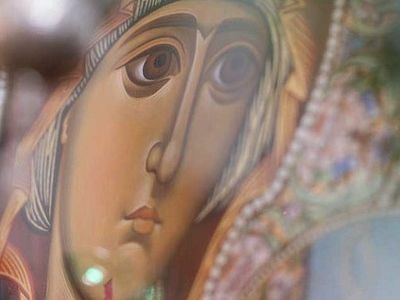 On the feast of the Nativity of the Most Holy Theotokos the parish of the Church of St. John of Kronstadt in Kirovskoye gathered for the first Divine Liturgy after the August’s shelling. 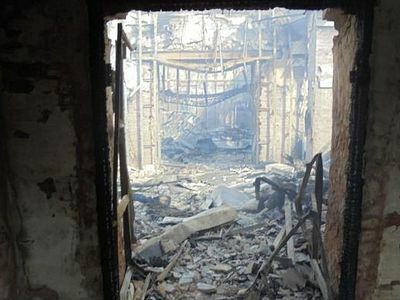 The service was celebrated in the open air near ruins of the church which cannot be restored, reports the Horlivka and Sloviansk Diocese’s website. On August 23, during artillery shelling of the town one shell broke through the roof in the center of the church and brought down the ceiling onto the city residents who were praying at the evening service. Three people were killed and several more people severely injured. Among those injured was the second priest of the church, Archpriest Sergy Piven. During the same shelling, one shell hit a hospital where two people were killed and many injured. The shelling is continuing in the town even now. According to the church Rector, Archpriest George Tsyganov, even in these days of the truce declared not long ago, the war is going on. Nearly every day there are new victims among the civilian residents and their houses are being damaged. Now, with coming of cold weather, many families are returning to the town in spite of the shelling. It was decided to resume celebration of services near the ruined church because the parish of St. John of Kronstadt is the only church in the town. And many believers of Kirovskoye cannot imagine their lives without Liturgy. At the present time, Divine Liturgies are served every Sunday: during warm weather—in the church courtyard in front of the temple, during bad weather—in the summer kitchen building near it. Despite the lack of financial assets, the congregation members are not losing heart and are continuously helping the people who have remained in the town. There is a humanitarian aid collection center on the territory of the parish—warm clothes and other things for homeless fire victims and families in need are brought here from all over the town. Until recently, the parish has on a voluntary basis helped rescue families from under the shelling and taken them to other Ukrainian towns or to the border with the Russian Federation. A parish driver, assistant churchwarden Vyacheslav Gusakovsky, was killed during one of such journeys while he was driving back from the Russian border. Later the Ukrainian media accused the slain driver of transporting weapons and explosives. On his minibus Vyacheslav Gusakovsky helped evacuate dozens of children from the town and neighboring villages during shelling. He had a wife and four small children, the youngest of them being only 2 years old. After his tragic death, there is virtually nobody left in the town to evacuate those who have no transport of their own. It is already impossible to restore the Church of St. John of Kronstadt. It has been decided to rearrange and use the building of the Sunday school as a church. Construction of the Sunday school building began last year, but Kirovskoye residents do not have enough funds to complete its construction.